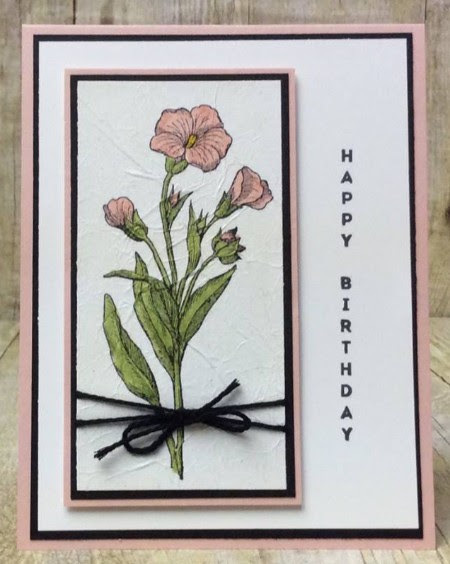 With all this rain that Northern California is getting, I thought it would be appropriate to work on a card with pretty flowers! I love the rain but I also look forward to the Spring flowers that will be here in less than two months. Here is a card that uses the faux silk technique.....I know this isn't a new technique but it is one that I love to use especially with flower stamp sets. Basic Black: 4” x 5 1/4" 2 3/8” x 4 1/2"
Score the Blushing Bride card base at 5 1/2" and fold. Use Stazon Jet Black ink to stamp the flower image from Butterfly Basics onto a piece of tissue paper (3 1/2" x 5”). 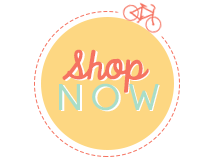 Color the flower using Blushing Bride, So Saffron & Pear Pizzazz Stampin’ Write Markers. Crumple tissue. On the smallest piece of Whisper White cardstock sponge on a light layer of Multipurpose Liquid Glue. Uncrumple the tissue paper art piece and lay on top of the glue, leaving wrinkles in it. Allow to dry. After the art piece is dry cut to 2 1/4" x 4 3/8”. Double wrap a piece of Basic Black Solid Baker’s Twine around the art piece and tie a bow. 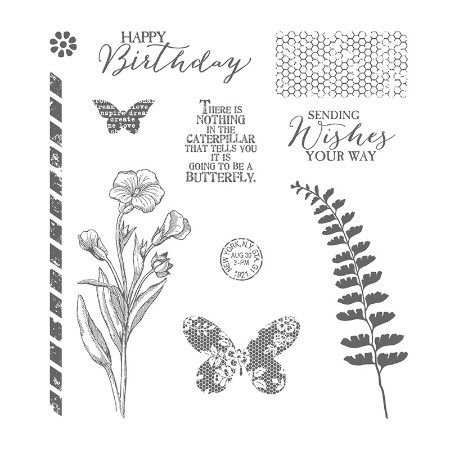 Use Stazon Jet Black to stamp Happy Birthday from Vertical Greetings onto the Whisper White mat. Glue all the mats together. Pop up the matted art piece using Stampin’ Dimensionals.